Have you been trawling the web looking for Party Bands in London? Are you getting the impression that most of them are just a little too similar? Looking for something different than most cover bands are presenting? Well, we would like to suggest you’ve landed in just the right place! For London Party Band hire slightly at odds with the others, the difference being a New Orleans Twist, we heartedly recommend The Mississippi Swamp Dogs. They offer a terrific night of high energy entertainment and a dance floor packed with happy revellers. Although we have a litany of testimonials, we have, instead, chosen snippets of video from delighted brides, portraying very strongly, exactly how the band are received wherever in London the band play! Party Band London. Think Mississippi Swamp Dogs. So, it’s obvous we have the party classics covered. The guaranteed floor fillers that the Mississippi Swamp Dogs play. To add to these we will spice things up with some wonderful New Orleans bar songs. Check out this funky clip below. We add swing, soul, jazz, and latin music to the mix. Equally at home playing for private clients or in a corporate setting. Do you want to check the band out? Click here to see where and when we are playing. As a successful London group we appear regularly at venues such as Ronnie Scott’s, Boisdales of Belgravia and Canary Wharf, The Crypt at St Martins in the Fields and the Hideaway in Streatham. Do ask us if you want to see the band in action. If we can get you in to a venue as a guest, we will. 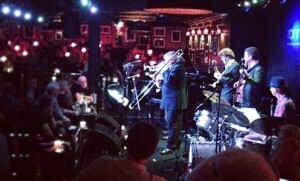 Party Band London-The Swamp Dogs at Ronnie Scott’s. Sold Out!! So, the band do the classic party hits, then you can hear amazing New Orleans repertoire from artist such as B.B. King, The Neville Brothers, Dr John, Louis Prima, Alan Toussaint and Professor Longhair. In fact, should you want a set of swing band favourites, we can do this too! Just so you know, we are not fresh faced kids out of college. This band of London professionals have been seasoned by the road!! The group have performed around the world in every conceivable situation and this means they know how to pull a great party out of the bag!! 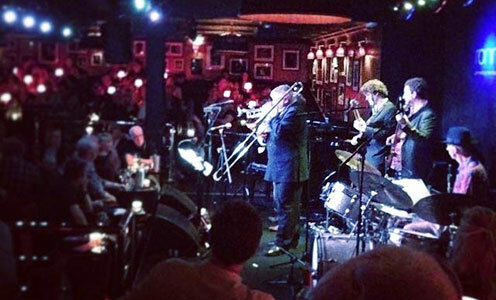 And that’s why we fill London Venues like the world renowned Jazz Club Ronnie Scott’s in London’s Soho. Selling out, every time with standing room only!! Now, we don’t expect you to just believe what we have written. After all, situated as we are in London, the city is full of great party bands. Check out not one, but two brides video testimonials taken from recent wedding parties in the London area. If you like what you read, see and hear, then go to our contact page here for a quote, or maybe you can click on this link for more information on the band, it’s our home page. Here is one of the venues in London that this great band play. Having a party? Why not check and see when the band are playing.